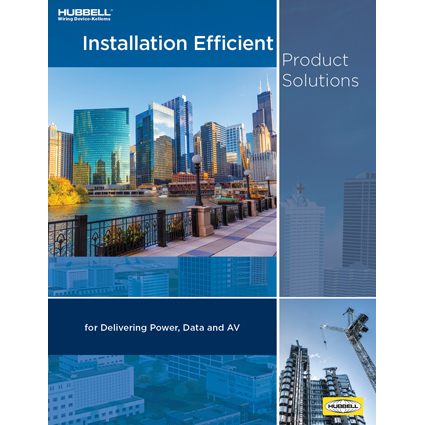 The Installation Efficient Product Solutions guide from Hubbell Wiring Device-Kellems highlights products designed to deliver power, data, and AV – while also supporting faster, more efficient project installation. Additionally, the guide features a section on the many services offered to help expedite the selection, ordering and installation of the many featured product solutions. Throughout the guide, data about installation savings is highlighted, illustrating how Hubbell product solutions and services can help improve the entire installation process. For more information about the Installation-Efficient Solutions guide, or to obtain a copy, contact your Hubbell sales representative or visit www.hubbell.com/wiringdevice-kellems/en.